Who cares that he's a powerful world leader? Canada's prime minister is probably used to feeling pretty adored abroad, where he's been called "The North Star" by Rolling Stone and the "Danny Zuko of international politics" by the Sydney Morning Herald. He even once got away with flirting with Queen Elizabeth II. He doesn't fare too badly at home either, where he still regularly gets approached for selfies and recently met a Syrian family who named their newborn "Justin Trudeau" as a thank you to their adopted country. 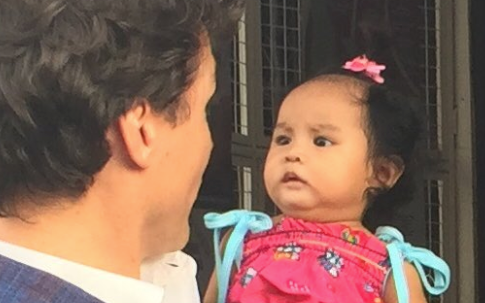 But it seems that Trudeau may have finally met his match in this baby who is having none of it. 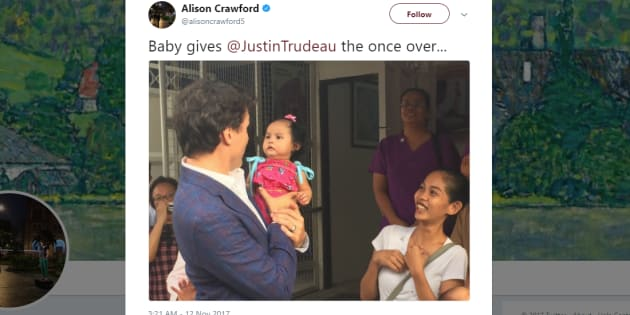 CBC reporter Alison Crawford tweeted the image from Manila Sunday, where Trudeau had just landed to attend summits related to the Association of Southeast Asian Nations. As politicians so often do, Trudeau held a local baby while greeting a crowd of people during a visit to a non-government women's health advocacy group. A more posed photograph showed a smiling Trudeau holding a fairly chilled out baby girl. Prime Minister Justin Trudeau carries a baby during his visit at a non-governmental organization in Manila, Philippines, Nov. 12, 2017. But Crawford's candid photo revealed the hard truth. Babies, guys. They hold nothing back. Trudeau wasn't the only foreign leader having an awkward time of things in Manila, though. U.S. President Donald Trump had a heck of a time handling the ceremonial handshake at the opening of ASEAN on Monday. The instructions "briefly baffled" Trump, according to the Associated Press. Prime Minister of the Kingdom of Thailand Prayuth Chan-Ocha, Russian Prime Minister Dmitry Medvedev, Prime Minister of the Socialist Republic of Vietnam Nguyen Xuan Phuc and U.S. President Donald Trump on Nov. 13, 2017. Well, he got there eventually. But anyway, don't worry about Trudeau's feelings. The prime minister later sat on a panel to talk about Canada's feminist foreign policy, Crawford tweeted. And this audience was nothing short of receptive to his charms. Yep, he'll be just fine.